This month we are featuring Luis Murillo, Principal of Skoglund Middle School, Center Colorado. Mr. Murillo has been a principal at Skoglund Middle School in the Center Consolidated School District for the past four years. Prior to that, he was a counselor at Ortega Middle School in Alamosa, CO. Mr. Murillo brought to Center a fundamental belief in educating the whole child. Toward these efforts, he has instituted and developed a number of programs to ensure that not only are we developing young academics, but also young people armed with the skills necessary to successfully traverse an ever-changing world. 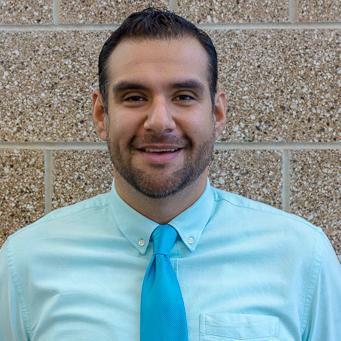 Mr. Murillo has helped to transform a discipline program focused on punishment to one that is focused on accountability and the development of life skills to change behavior. This includes introducing Positive Behavior and Intervention Supports as well as Restorative Practices. As a result the number of hours our students spend in ISS (In-School Suspension) has dramatically reduced from 710 in 2015/2016 to 139 hours this school year. An integral value of the Center School District is the health and wellness of the student. Mr. Murillo emphasizes that if students do not come to school ready to learn, they will not be able to fully engage in all that we are offering them academically. Under Mr. Murillo’s leadership, all students in grades 6-8 are in PE and have required health education aligned to the Colorado Comprehensive Health and Physical Education standards, and these classes are held to the same rigor as other academic content areas. On the 2016 Healthy Kids Colorado Survey, compared to the average for Colorado students, 25% more Center students report the recommended daily dosage of 60 minutes of physical activity. Students who report tobacco use is half that of Colorado’s average. The same is true for alcohol use. Marijuana use in Colorado overall is 2.4 times that for Center. These and other efforts have led to Skoglund being awarded Healthy School Champions for 6 years in a row. When Mr. Murillo first began his tenure at Center School District, he understood the need for more parent involvement. His own educational experiences underscored the need to parents to feel engaged and part of the school community. His dedication to this effort has been unparalleled. He developed a parent leadership academy called Parents Involved for Center Students (PICS). This group meets on a weekly basis to address parent concerns, interests, and education. Mr. Murillo’s vision has taken this from a group of parents merely following him, to a group of parents taking the charge to proactively address parent and student needs. Currently, this group has parents who sit on the PICS Advisory Board and lead the group itself, but also parents who sit on our District Accountability Committee, the District Health Advisory Committee, and the Middle/High School Building Leadership Team. Mr. Murillo has truly embraced the idea of meaningful engagement for parents as leaders and partners in the education of our students. A Core Value of the Center School District is that, “With our support, all students can achieve academically and be successful in life.” Mr. Murillo has fully embraced this value and helped develop a robust career development program starting in the sixth grade. Through advisories, students engage in social-emotional learning and career planning on a weekly basis. Students are developing post-secondary aspirations and plans, learning what behavioral skills they need to be successful, and making connections between the academic content they learn in their classes and their future career needs. On the VOLT climate survey, on a range of 1 (strongly disagree) to 4 (strongly agree), Skoglund students averaged 3.17 (compared to 3.13 for Colorado) for questions related to teacher support. For overall school climate, Skoglund was at 3.2 compared to 3.09 for Colorado. Lastly, Skoglund has maintained its CDE “Performance” accreditation for the past four years and it is inching closer to getting to achievement across the board. The most exciting aspect of my job is that I get the honor to work in a serving field right next to a bunch of inspiring professionals who are just as passionate as I am about educating students. Let’s face it, Center, Colorado is not the most enticing town in our state; yet these individuals recognize the need and honor the right of providing a rigorous education to our students. With the teacher shortage we have in our state these teachers can easily find jobs in other school districts in our beautiful state and they choose to walk right next to me to serve the stakeholders in our beautiful little town. I also get excited to serve in a community that mirrors my values and continues to fuel my fire to serve. I see my story in the stories of my students. I see my parents in the parents I serve. The potato fields surrounding Center remind me of the strawberry fields in Oxnard. The food we eat when we celebrate remind me off my mother’s kitchen. I get excited every day to be leading in a Latino community. The advice I would give a new leader it to always stay true to your roots. Remember where you came from. The analogy that comes to mind is that of a tree. A tree that is deeply rooted will not topple when the storm hits. A tree that is not will not be able to withstand it. In the field of service and leadership there will be storms. Follow your values and see them through. Y como dice la célebre pintora Frida Kahlo, “pies para qué los quiero si tengo ALAS para volar”. If you catch me outside the office you will probably see me rooting for our kids at a sporting event. If you catch me outside of the San Luis Valley you will find me spending time with family and loved ones or at a play. I really enjoy small production plays and live music. CO- ALAS means a lot to me. My first year as a principal was a rough one. I was approached by Jesus Escárcega at a CASE conference. He made me feel like I was his family. He told me about ALAS and it has truly been THE turning point in my career. CO-ALAS continues to fuel my fire. I have met so many inspiring leaders that I have learned so much from. My professional network has grown. More than anything CO-ALAS showed me that I am not alone and that there are many of us doing the right work and fighting the fight for equity in the trenches.